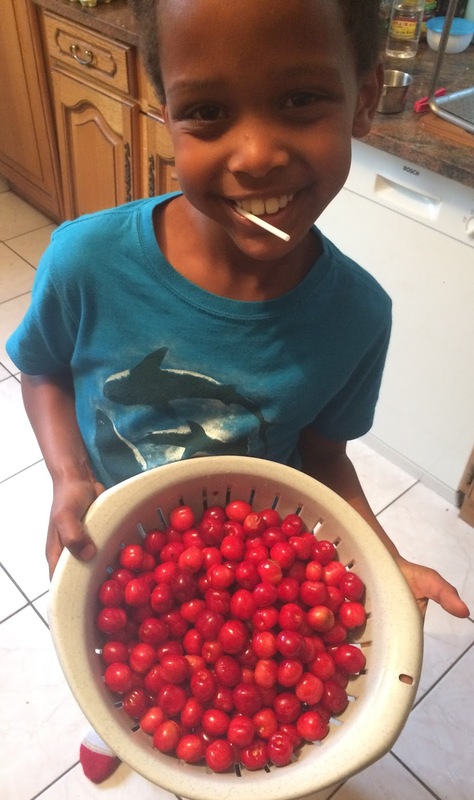 Our Christmas cards are being mailed from the states, and we're here in Burundi, so we thought we'd post our Christmas family newsletter here on our blog. 2017 Began with our family living in Albertville, France where we were busy learning French in preparation to live and work in Burundi. 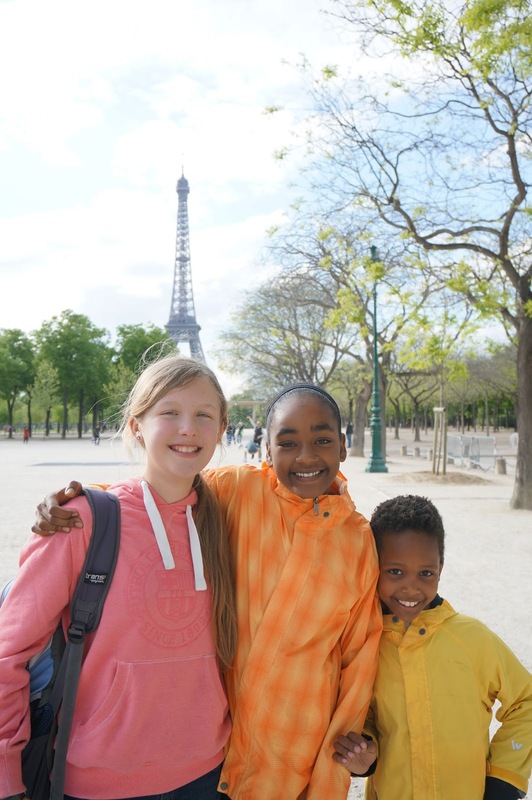 While Greg and I attended language school, our kids experienced the “adventure” of the French school system, an experience none of them enjoyed. However, a perk of life in France for our kids was that, in January, they all joined an after school ski club and learned to ski. In July we finished our language studies and returned to the US for 7 weeks. 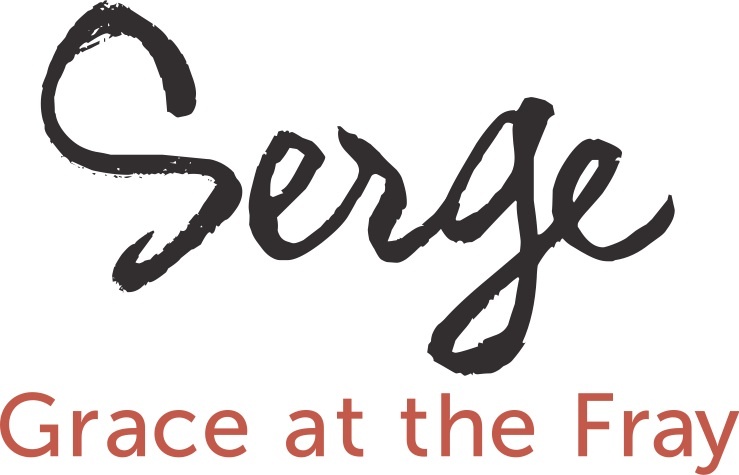 We lived with Greg’s parents in WA, and Greg was able to work with his old anesthesia group. Stephanie and the kids traveled to Nebraska to visit Stephanie’s family. We greatly enjoyed our time in the states and the time spent catching up with friends and family. At the end of August we packed our 12 bags with everything from a Christmas tree to anti venom and headed off to Burundi. 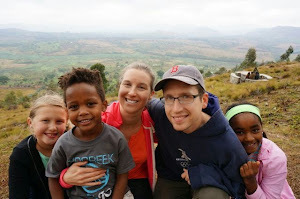 Our transition to life in Burundi has been smooth, and for that we are grateful. Greg has been busy teaching nurse anesthetist and medical students as well as working as an Anesthesiologist in the hospital. He also leads a weekly Bible study for the medical students, completely in French! Stephanie teaches two classes a day to the missionary children. Each week she visits the NICU and malnutrition wards of the hospital to show videos on breast feeding, and one week out of the month she works with our eye team giving chemotherapy to children with retinoblastoma (an eye cancer). Both Greg and Stephanie are diligently studying Kirundi, the local language. Ella is almost 13 and as tall as Stephanie. She enjoys reading, playing the piano and ukulele, and going to the hospital to play with children. Mekdes is 12, she loves soccer, reading, cooking, and playing the guitar. She enjoys going to the field near the hospital to joining groups of kids playing soccer or play ultimate frisbee with our teammates. Biniyam is 8 and continues to be his energetic comedic self. He’s loving life here in Kibuye where there are always kids to run and play with. He loves school, electronics, and making people laugh. 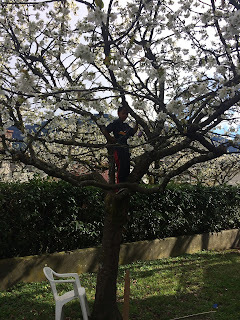 A big part of this school year for him has been catching up on the things he missed learning last year in France. We hope that your finding peace and joy in the midst of this busy season. As we reflect on the birth of Christ we are renewed in our hope, that our God, who fulfilled his promise to send a messiah, will also fulfill his promise to return and set all things right. There’s a term we learned in missionary training, “twang” which describes the feeling that you get when your expectations are different than the reality, it feels like a rubber band snapping on you. The degree of the twang, of course, all depends on how far your expectations were from reality. 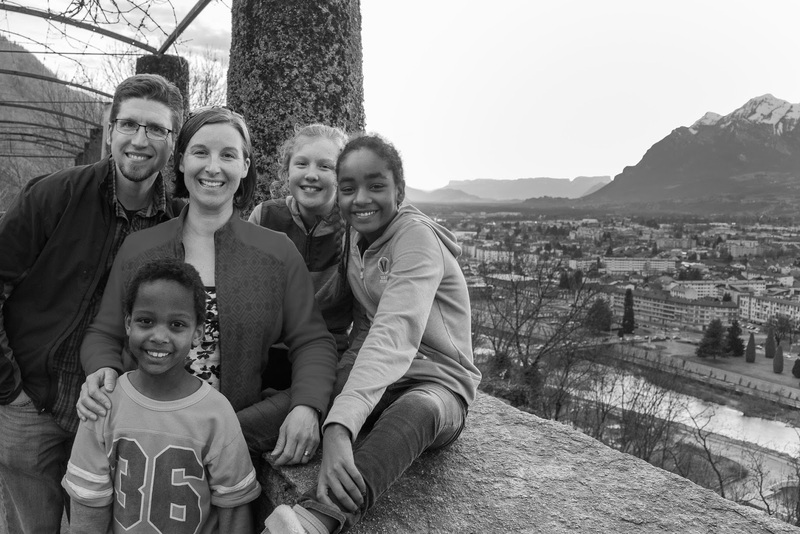 We had been told by many of the missionaries on our team, who have gone to language school here in Albertville, to expect a hard year. I believed the hard year would mostly be due to the difficulty of language school and the less than encouraging mode of French education. But, I thought, we’ll be living in a small French town in the Alps, our time outside of school will be amazing! And then we arrived, on a night that was so hot and muggy, the van pulled up on the side of a busy street and our apartment was pointed out to us, above a kabob shop bustling with young men. All our suitcases were unloaded and lugged up the dirty staircase to our 3rd floor apartment. The staircase also went down from the building’s entrance into a labyrinth of storage areas. I went to sleep thinking how I never wanted my kids coming in or out of our building on their own in fear of someone following them in and pulling them down the stairs. My first big twang. The next twang was apartment living with children. Anyone who know our son knows that words like quiet, still or boring would never be used to describe him. Biniyam has a big personality, he has a lot of ideas expressed in many words often at top volume. Biniyam and apartment living were a hard mix. He simply lives life loud, he shuts cabinets with a bang and bounces across the floor. And out of my mouth came constant correction for things that weren’t actually wrong, but just normal 7 year old boy noise ricocheting off the walls of our small space and being heard by the neighbors above and below us. Through the fall and winter we went through our routine, getting home at around 5 PM, making dinner, eating, doing dishes by hand, hanging laundry around the living room to dry, kids homework, our homework, kids to bed, and then trying to convince Biniyam to go to sleep when he could hear any movement taking place in the apartment. We usually spent all day Saturday in the apartment studying and Sunday, our day off from studying, we’d be itching to escape the walls around us and we’d head out for a hike. In all of this Bini was getting way too much electronic time and way too little time playing outside. Life outside our apartment was hard and uncomfortable due to all the French and cultural differences (and yes, there are many cultural differences) and life inside our apartment was difficult too. One of my friends here described it best when she told me “I have no place here that feels tranquil” and that was just it. Things weren’t bad and I felt petty complaining, but there was no place that felt tranquil, for even those lovely Sunday hikes in the Alps were accompanied by at least one grumbling child. In January Greg and I were talking about all this when it occurred to me that there was a family who had left France early, and that they had lived in a house (rented by our school). So, we inquired, and found out that the house was sitting empty. We got the keys and went to see it, it had a yard, a dishwasher and a dryer! But the rent was more than what we paid for our apartment. We spent the night talking and praying about whether or not we should move. That night we got notified that we were getting another check, one we hadn’t expected, back from the sale of our house. The money we were getting back would cover the difference in rent for our months remaining in France. Praise God for great timing and for the comfortable home in which we’ve been living since mid January. 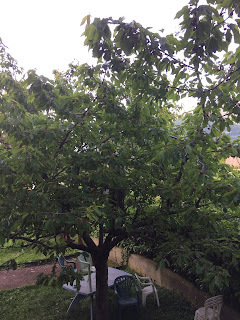 It has made a huge difference in our enjoyment of daily life here in France. We now have a place that feels tranquil. And Biniyam, he’s has been profiting well from our new pad. 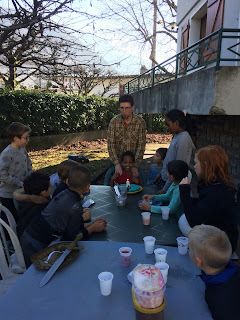 Soon after we moved in we were able to host his birthday party in our yard, 10 active boys, 5 French, 5 American, doing an obstacle course, climbing trees and playing soccer. 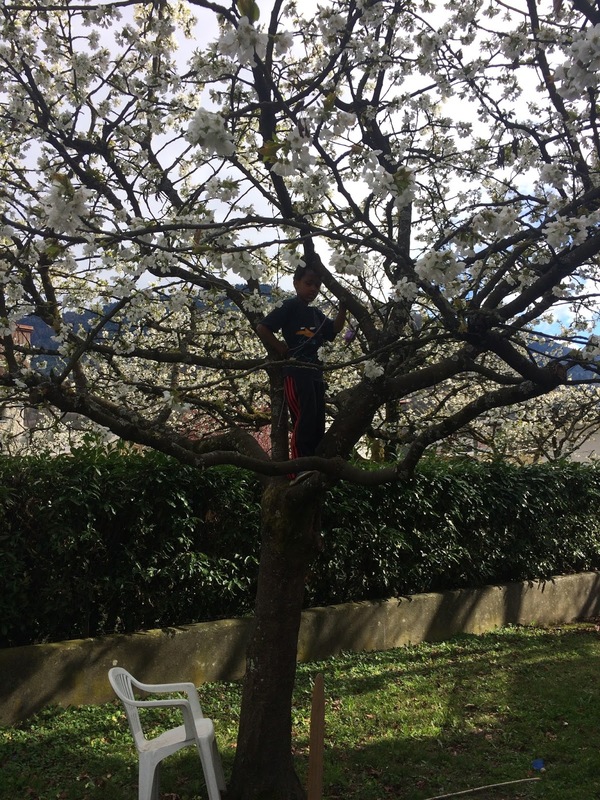 After his birthday party Biniyam spent many weeks working on his tree climbing skills. 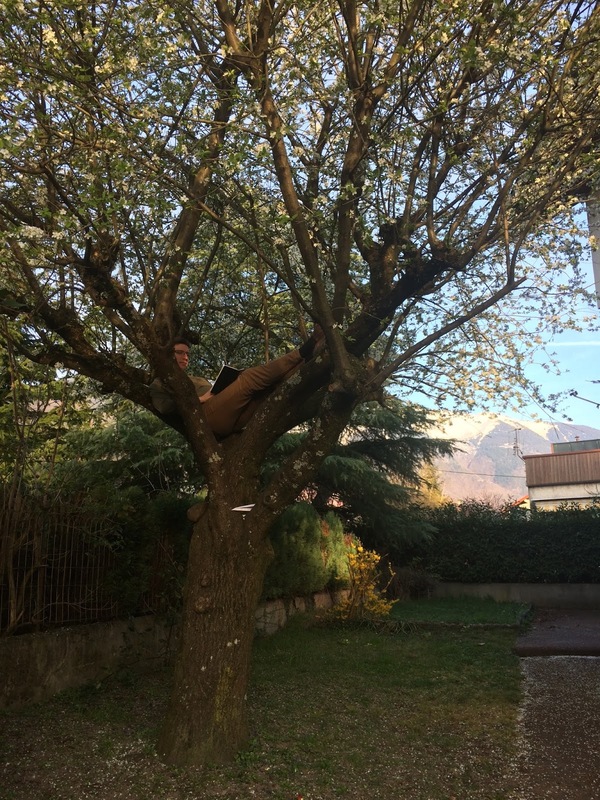 Mekdes spent many hours reading in the tree and Greg tried to camouflage himself into the tree. And then the tree erupted in cherries and many more hours were spent collecting and enjoying its bounty. 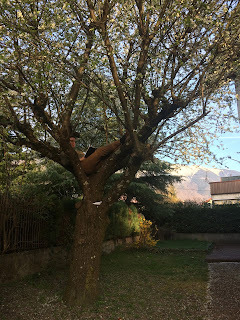 How many Sunds can you find in this tree? Then Biniyam got into elastic design. I don’t know what inspired this but it was a great occupier of time. And now Biniyam's time out of school is spent outside in his Alchemist shop, making potions with whatever he can find. We’ve said right from the get go that France has been harder for our kids than it has been for us. After all, the language school we attend has been teaching missionaries French for 50 years. They understand our lack of comprehension, they speak French to us slowly and at the start of the year they even translated things into English for those of us who spoke no French. Our kids did not have that luxury. I’ve heard their teachers speak. 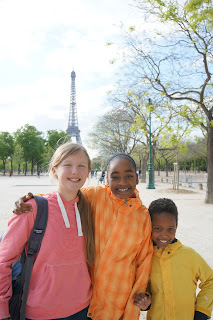 They speak fast, very fast, and at first they did not understand how very little French our kids understood.In addition to all the language woes, there have been instances where we, as parents, have messed things up, or misunderstood, and made difficult French school even more difficult. Or, the first day of school for our girls (they are both in middle school although Mekdes should be in 5th, the age cut off is different here). They had received a very long supply list and we had visited multiple stores, multiple times, to figure out what they needed and get it all. However, we thought that the 1st day of school was an orientation and that they didn’t need to bring anything. I sent them to school with one small bag containing 2 pens and 2 small notebooks. Then, at drop off, we saw all the other students arriving with backpacks, the girls did not want me to humiliate them by returning with theirs. But, once in their classroom and seated apart, the teacher YELLED at Ella for not having the right stuff. (Can you imagine anyone yelling at Ella?) It was so hard to have Ella, who’s always loved school, beg us not to send her back. Or on Tuesday, when I sent Biniyam to school in a speedo, a hand-me-down speedo. But alas, he’s swimming for PE and that is what the boys are required to wear. But, the one incident we will be talking about for years to come is the day we meticulously translated the note in Biniyam’s agenda at 9:00 at night. The note was about a field trip for the next day where the kids were going to walk about 2 miles to a park and then back to the school. The note said to put a reflector vest on your child. We were not sure what they were talking about, and all the stores were closed, so I took the only thing we had, the florescent yellow vest with reflectors that is part of our required car safety kit. It was way too big for him and looked ridiculous, but, the next morning off he went to school as pictured below. As we walked towards the building I noted that no other child was wearing a reflector vest. I told Biniyam I thought we should take his off, but he wouldn’t “I don’t want to make my teacher mad, I don’t want to get yelled at, I think I should keep it on.” So off to school he went. About an hour later Greg received a call from the father of one of Biniyam’s classmates, a fellow missionary. 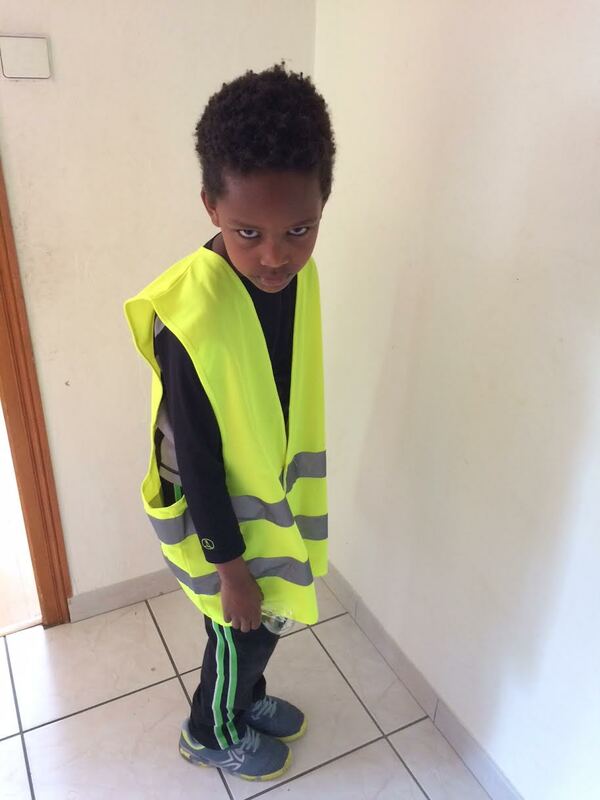 He said he was chaperoning the field trip and asked if he could take Biniyam’s reflector vest off as he was the only student wearing one. He also told us that yes, the note said to put a reflector vest on our child, be no one actually does it. 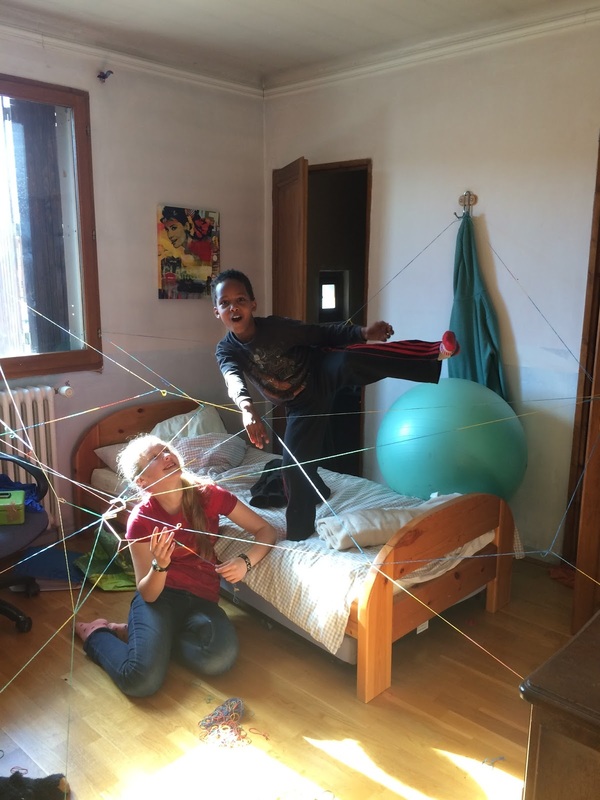 We’re grateful that this dad intervened to save Biniyam from a full day of being super safe and absolutely ridiculous. 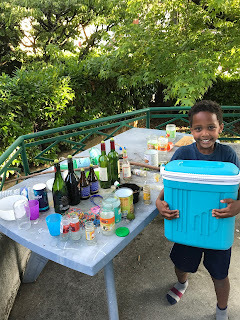 While we were in Burundi two years ago, I wrote a blog post about the top 10 things I missed about life in the U.S. As we have now been living in France for 7 months, I wanted to write a similar post, given a different perspective. However, it occurred to me that life in France is not really comparable to life in Burundi. It is true that language learning has been extremely challenging (and sometimes humiliating). However, overall France is a pretty comfortable place to live for a year. In fact, aside from our family and friends back home, the only thing I could think of that I really miss is nachos. Yes, nachos. As rich as France is in history, culture and cuisine, when it comes to Mexican food, it remains deeply impoverished. So, instead I decided to compile a list of the top 10 things I have found most surprising about France. This is a beautiful country. Granted, the US is a beautiful country as well, and we have similar landscapes back home. The difference is, you cannot drive across the U.S. in a single day, as you can in France. In France, within 4 hours you can go from skiing in the Alps, to sitting on a beach on the French Riviera. But what also makes France so beautiful is the buildings. Rather than demolishing old buildings, the French preserve them. And it seems that in every city or village you pass through, there is a church or cathedral, often hundreds of years old which hovers overhead. The doors of these churches are almost always open. It often feels like being transported back in time. It is really hard to find a full "American" sized cup of coffee in France. When you order a “coffee” you get a tiny cup, filled with a tiny amount of coffee. In fact, the only place in Albertville where I have found I can get a “normal” sized cup of coffee is McDonalds. Sadly, there is no Starbucks in Albertville. In fact, I think the closest Starbucks is in Lyon or Geneva, both 2 hours away. The French do NOT drink liquids on the go. If you see someone walking down the street carrying a coffee mug, it is a pretty safe bet that they are not French. Despite having been the host of the 1992 Olympics, Albertville is not a tourist destination. Many people pass THROUGH Albertville on their way to nearby ski resorts, but it is rare to run into another American in town who is not a student at our language school. Before our arrival, many people warned us about the exorbitant cost of living in France. We have not found this to be true. Granted, there are some things that are more expensive here (such as gas), but overall, food and rent are pretty comparable to what we paid in Bellingham. The French word for foosball is “le baby-foot”. How cute is that? Because they have little tiny baby feet! Highway rest stops in France are amazing! Given our frequent weekend road trips, I like to think I have become a connaisseur of rest stops (classy, I know). They are always immaculate, with clean bathrooms and often a general store where you can find just about anything you can imagine. And the food is outstanding. While many Americans have trouble adjusting to “La bise”, the custom of kissing on each cheek when greeting someone, the French find hugging to be WAY to intimate. They can’t seem to understand why Americans always want to be so close to someone so quickly. The French are not, in general, an easily excitable people. But if you want to shock a French person who is curious about life in America, tell them how much you pay for health insurance. French culture is more influenced by American culture than I thought it would be. American music is played everywhere here, American films are shown in the theaters (usually overdubbed in French). While I think most Americans would be hard pressed to name even 1 French actor or musician, the French are very familiar with many of ours. Yes, they even dig Justin Bieber. I drive down this street 4 times each day, as our girls school is right behind the church at the end. I would like to share with you a new condition which I have diagnosed myself with. I believe this may be a unique case, so for those of you interested in the field of psychiatry and mental health, this could in fact be a publishable case report. My name is Greg, and I have bisous anxiety. 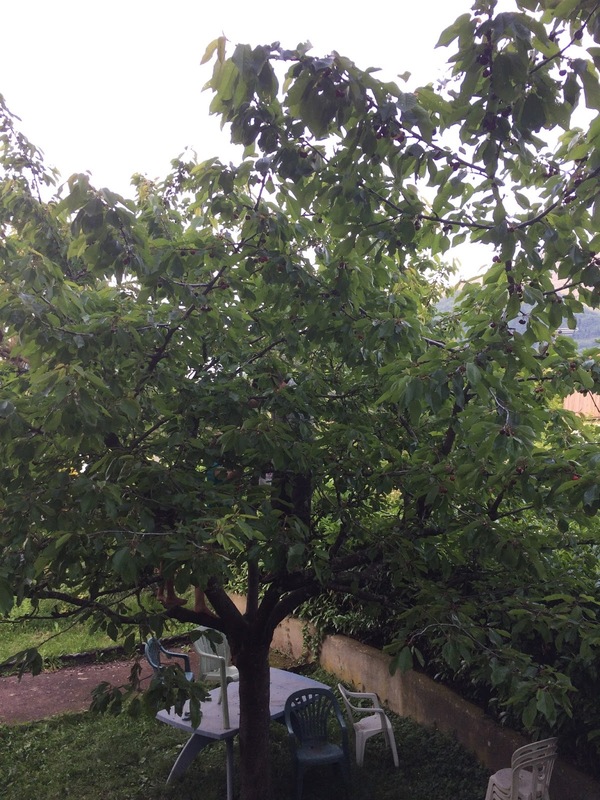 We are almost halfway through our 10 months of language school in Albertville France. For those of you who are unaware, the French have a greeting which involves a kiss on each cheek. This is not something you do in formal or professional settings, but rather takes place on a regular basis among friends and family. It is a beautiful custom, and the French do it with complete ease. Sadly, I have been here for 5 months, and I am still struggling with knowing exactly how and when to use this greeting. I am not a germaphobe, so please don’t confuse my malady with that (you can’t really be a germaphobe and function in a place like Kibuye). My anxiety revolves more around my fear of kissing someone I am not supposed to kiss, or not kissing someone I should kiss. Or doing it all wrong. I am awkward. I am an American. The problem starts with who to kiss. “La bise” is not just between men and women. After two men become friends, it is common for them to kiss as well. But how well do you have to get to know a dude before you go in for a smooch? And even with women, I just don’t know how well I am supposed to be acquainted with someone before we “faire la bise”. Often I just stand there like a deer in headlights, like a frightened turtle … just waiting, trying to anticipate their next move. I also can’t seem to remember which cheek I am supposed to kiss first. This has led to a few especially awkward moments with certain men at our church who I ALMOST ended up kissing right on the lips. I am awkward. I am an American. In addition, I still don’t know exactly what I am supposed to do with my hands. Do I wrap them around the other person, do I keep them at my sides? For the love of God … what do I do with my hands! To make matters more complicated, I was recently informed that the number of kisses changes depending on which region of France you are in. Which means, I can never leave Albertville again. Unfortunately, although greetings in Burundi are different, they are no less complicated. After several months in Burundi, someone explained to me that when two men greet each other, it is common for them to grab their arm. The level at which you grab their arm (eg. wrist, forearm, elbow) conveys to the other person your understanding of their social status and your respect for them. Pretty sure I was doing this backwards for several months after our arrival, thus offending those I met in the highest positions of authority. It would probably be best if the team keeps me away from visiting dignitaries. It became clear to me a few years ago that one of the keys to thriving as a cross-cultural missionary is being willing to embrace those awkward moments, and even to laugh at yourself afterwards. If not, you are apt to become paralyzed with fear and insecurity. And so, I will leave our house today, and I may even kiss someone I am not supposed to kiss. And if the next time you see me awkwardly looking at your cheeks or drawing near to you and then pulling back or if I seem paralyzed with confusion and indecision, please give me some grace. My name is Greg Sund. I am awkward. I am American, and I am a recovering bisous anxiety victim. “Aren’t you fluent in French yet?”. This is a question that has been posed to me by friends back home. The short answer is, no … no I am not. But when will I be fluent? This is a question I have started to ask myself, which has caused me to think more recently about what it truly means to be “fluent” in a language. Fluency in language is an interesting thing. To be honest, some days I am not sure I am fluent in English. Yes, I can hold a conversation. However, there are still MANY words in English for which I still do not know the meaning. And although I like to think I understand English grammar, I have a suspicion there may be an English teacher or two out there reading my blog who are twitching at each subtle mistake. And regarding spelling … well, thankfully my computer now fixes most of my speling mistaikes. Before we came to France, BIniyam tried to convince me that he didn’t need to come because he was already fluent in French. He knew how to say “bonjour” and “ça va?”. He also claims to be fluent in Kirundi, Spanish and Japanese. I think am going to be a little slower to apply this word to myself. In fact, I am not sure I will ever reach the point where I feel confident enough to label myself “fluent”. For me, that is a weighty word. The U.S. State Department has given me some guidance on this topic, as they have created a Proficiency Code, with a scale of 0 to 5. In fact, anyone can take this exam, which will inform you of which level you fall under for a given language. Level 5 means that you are able to use a language in reading and speaking, “fluently and accurately” on all levels pertinent to professional needs. Well, I did “fluently and accurately” order a baguette this morning … does that count? After studying French full-time for the past 3 months, I stand in awe of people who speak two or more languages “fluently”. In fact, the place where I have met the most number of people who I would say fall into this group, are Africans, especially the medical students I work with. Many of them switch back and forth between French, Kirundi, and sometimes English, with complete ease. The students who come to us from Congo (where there are many more languages spoken) sometimes speak 7 or 8 languages with fluency. Learning a new language at the age of 42 offers daily opportunities for discouragement. Although I tested into an intermediate level in our school, I continue to have opportunities listening or speaking, in which I end up completely lost. We are so grateful for the language partners who meet with us each week. There are dozens of men and women here in Albertville who donate their time each week to meet one on one with the students at our school to give us practice in conversational French. These opportunities are massively important for us, but sometimes leave me feeling deflated and wondering what just happened (“wait … I agreed to do WHAT to your cat?”). This morning I needed to respond to an e-mail I received from a nurse anesthetist in Burundi. The e-mail was in French. An e-mail that would have taken me 2 or 3 minutes to compose in English, took me 30 minutes to compose in French. I know I should be used to discouragement, having gone through medical school and residency, where one is often humiliated (sometimes in front of large groups of people), but somehow this feels different, and I am not sure why. Perhaps it is because I have a family now, and the amount of time I have each evening to study is more limited. Or maybe it is because trying to talk to people in a language that is new to you leaves you feeling vulnerable. Or perhaps it is because the line between success and failure, or fluency and non-fluency, is a bit more hazy when it comes to language learning, compared to the study of medicine. So, I go back to the bible to encourage me, and once again I find comfort in the words of 2 Corinthians 12:9-10: “But he said to me, ‘My grace is sufficient for you, for my power is made perfect in weakness’. Therefore I will boast all the more gladly of my weaknesses, so that the power of Christ may rest upon me”. Yes, I am making progress, and I am able to speak French better than I was 3 months ago, but I am weak, and I will likely continue to embarrass myself in front of native French speakers. And some days I will feel like an utter failure. But it will be okay, because His grace is sufficient. Our time here is important, and in fact is crucial to our success in Burundi. We would not be here if this was optional. We are grateful for this school, our teachers and our language partners. And we are grateful for everyone back home who is supporting us prayerfully and financially to allow us to invest this year in our future work in Kibuye. Ultimately though, we believe this is not our work, but is God’s. And so, our “success” will rest not on our fluency, but on His grace. The Bible is very important to me. I start everyday by spending time in the Bible. One part of the Bible that has been especially dear to me is 2 Timothy, the letter written by the apostle Paul to Timothy, his dear friend and brother in the faith. I have had long conversations about this book with many in our church, especially our pastor Rob Berreth. In the past 15 years I have gone back to this book time and again, for instruction, for encouragement and for hope. Yesterday we got to visit some incredible sites, including the Colosseum, the Palatine Hill (home of Rome’s emperors) the Senate hall (the birthplace of democracy). But we also got to visit a place that many people probably overlook. It is the site of what was called Mamertine prison. This is the prison in which the apostle’s Peter and Paul were held before their executions. It is also believed to be the site where Paul wrote 2 Timothy. Our family got to stand in the very cell where these words were penned, these words which have been read for the past (almost) 2,000 years by people from every country on the face of this earth. It was such a tremendous gift to get to visit this prison (now converted into a museum). It was a tremendous encouragement to my faith to stand in that cell and to remember that this book I read everyday is not a fairy tale, but is history and was played out by men and women who held the Gospel so tightly, that there were willing to die rather than deny it. I thank God for this opportunity, and for the reminder that He can even use a man chained in prison to bring hope and peace and life to countless people. The cell where Peter and Paul were held. click here for full resolution version.